This dish is a legend! Creamy, juicy and absolutely delicious.. Greek moussaka (mousaka) is one of the most popular dishes in Greece, served in almost every tavern and prepared in every household on special occasions and big family meals and for good reason! To prepare a traditional Greek Moussaka recipe, luscious layers of juicy beef mince (or lamb) are cooked in a tomato based sauce, layered with sweet eggplants and creamy béchamel sauce and baked together until golden perfection.. Simply irresistible! With this step-by-step traditional Greek Moussaka recipe you can easily recreate this traditional delight from scratch! So go ahead, indulge yourself to this little sin.. This easy to follow Greek moussaka recipe never fails to impress and is always a crowd pleaser. 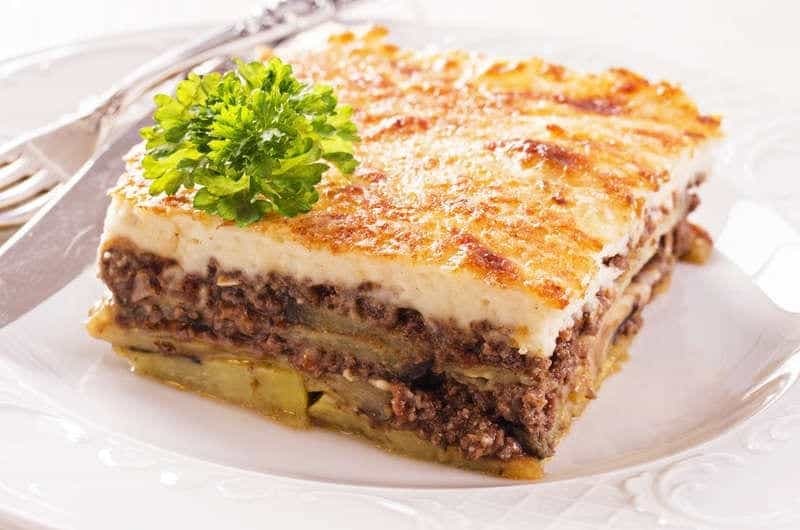 The essence of this traditional Greek moussaka recipe can be summarised in three key stages: preparing the meat filling, preparing the béchamel sauce and cooking the eggplants. Each stage will require dirtying some pans, but i think you will agree that the end result is well worth it! The traditional Greek moussaka recipe calls for either lamb mince or a mix of lamb and beef. But if you can’t handle its strong flavour and prefer a lighter version try substituting with good quality beef or veal mince. To prepare the meat sauce for this moussaka recipe, the ground beef is sautéed in olive oil, flavoured with onions and garlic and then simmered in red wine and tomato sauce. The aromatic herbs and spices used in the traditional moussaka recipe penetrate the meat and give a really characteristic taste and smell which permeates the house, once put in the oven! Let the sauce simmer for a while to allow the flavours to mingle. Are you a vegetarian? Not to worry, there is always a way to enjoy this delicious dish! Discover my latest delicious Vegetarian Greek Moussaka recipe with a delicious mushroom based sauce replacing the traditional mince. The creamy béchamel sauce is the most essential part for a traditional Greek moussaka recipe and probably the trickiest part too. To achieve the perfect texture for your béchamel sauce, add the milk (preferably lukewarm) a little bit at a time whilst constantly stirring. The perfect béchamel sauce for your moussaka should be smooth and creamy. The key is to whisk the sauce constantly to allow each time the flour to absorb the milk, so that it doesn’t get lumpy. Cook the sauce over medium-low heat in order to prevent it from burning and sticking on the bottom of the pan, but be careful to cook it enough, until you can’t taste the flour and is thick enough. The base for a traditional Greek moussaka is most commonly fried eggplants. Some moussaka recipes also use sliced potatoes, so if you like potatoes, try adding a layer of sliced potatoes as the first layer to this amazing dish for some extra comfort during the winter months. The traditional Greek moussaka recipe calls for fried eggplants (and potatoes), but for a lighter alternative, try drizzling the aubergines (and potatoes) with some olive oil and bake them for 20 minutes instead of frying them. Some eggplants may be bitter, so it is very important to remove the bitterness by seasoning with salt and letting them stand for half an hour in a collander. So go ahead, give this traditional Greek Moussaka recipe a try and amaze your friends and family with this extra tasty hearty dish! Oh and you can always read this delicious recipe in Greek here Παραδοσιακός Μουσακάς συνταγή (Μουσακάς με πατάτες και μελιτζάνες). Prepare the meat sauce for the moussaka. Heat a large pan to medium -high heat and add the olive oil. Stir in the chopped onions and sauté, until softened and slightly colored. Stir in the garlic, tomato puree and the mince breaking it up with a wooden spoon and sauté. Pour in the red wine and wait to evaporate. Add the tinned tomatoes, the sugar, a pinch of cinnamon, 1 bay leaf and a good pinch of salt and pepper. Bring to the boil, turn the heat down and simmer with the lid on for about 30 minutes, until most of the juices have evaporated. Prepare the béchamel sauce for the moussaka. Use a large pan to melt some butter over low-medium heat. Add the flour whisking continuously to make a paste. Add warmed milk in a steady stream; keep whisking in order to prevent your sauce from getting lumpy. If the sauce still needs to thicken, boil over low heat while continuing to stir. Remove the pan from the stove and stir in the egg yolks, salt, pepper, a pinch of nutmeg and the grated cheese. Whisk quickly, in order to prevent the eggs from turning an omelette! Assemble the moussaka. For this moussaka recipe you will need a large baking dish, approx. 20*30 cm). Butter the bottom and sides of the pan and layer the eggplants. Pour in the meat sauce and even out. Add a second layer of eggplants, top with the béchamel sauce and smooth out with a spatula. Sprinkle with grated cheese and bake the musaka in preheated oven at 180-200C for about 60 minutes, until crust turns light golden brown. Even though it will be really hard.. you should wait for the moussaka to cool down for a while before cutting into pieces. Serve the Moussaka with a nice refreshing Greek feta salad and enjoy over a glass of wine! Had the most heavenly version (lighter than my mother’s or mine) of this in Athens, under the stars with a view of the Acropolis. Love your recipes. ah that sounds magical! Thank you for your kind words and hope you’ll find many recipes that you’ll like! How did you get it to look like the picture above? Mine came out with the eggplants laying on top with the bechamel seeping into all of the moussaka. Chelsea you have to let the dish rest and cool off for a few minutes that’s why. Eli this moussaka looks and I’m sure its delish!! !and the recipe is authentic your site about Greek food is one of the best I’ve seen and your pics are making many people drool lol!! Any suggestions for making this for 30? Two pans or one large?? So … When do you add it? Lol. I’m not Greek I am going to make this tonight it looks sooo yummy and I love Greek food!! Can you freeze this after assembling, but before baking? You can skip the egg altogether. It just makes the béchamel a bit thicker but you can safely omit it. It’s perhaps a bit late, but, if you are vegetarian, why don’t you try a parmigiana ? It’s no Greek, but very mediterranean,just eggplants, tomatoes, mozzarella and parmigiano… and onions and herbs. Gorgious. While you can, its not recommended. The best way to do this would be to bake then freeze. Then thaw in the oven for 45 minutes or so. Hello Eli, can you use half beef and half lamb for this recipe? I find it tastes nicer with lamb but a bit too greasy? Wouldn’t be Greek without Greece! Sthaw in the oven how, precisely? Bake frozen at what temp ? I’m doing a party but have to prepare everything 2 days prior. Bit late for a reply but may help someone else. 2 days ahead wouldn’t need to be frozen. Refrigerated would be sufficient. If it is frozen, you will need to defrost it first. It would take hours if you wanted to finish from frozen,. Hello I love Greek food and have been to Greece many times to and brought all our Children too..mainly off the beaten track . We made this recipe yesterday, and loved the wonderful taste! I have made moussaka many times (but less frequently in recent years), so it was a pleasure to get back to making it at home. The only part I actually measured was the bechamel – for the meat sauce I just used the recipe amounts as an approximation – this worked out well for me. I used my own tomato sauce, made from tomatoes at their peak flavor. I used beef/pork ground meat – 70/30 – prob. would have been better with just ground beef. Next time I will add oregano, as I’m used to this taste in many Greek dishes. Despite the long prep time, this is dish well worth the time. I loved the very specific directions. Fantastic photos and clear instructions. On our family there is a great debate whether the authentic Moussaka should be lamb or beef and whether it should use Ceylon Cinnamon or Cassia Cinnamon. say it should be lamb and Ceylon Cinnamon. Nevertheless this is fantastic. Definitely a labor of love. Thank you. I love Greek Moussaka. Thanks for sharing recipe! Thanks for the recipe. A labour of love but definitely worth the effort. A hint for those who find lamb too fatty, make the sauce a day ahead and place into fridge overnight. The flavour develops and you can scrape the layer of oil/fat away. I noticed someone asked if you can freeze this recipe. I have done it successfully. I would recommend that it is defrosted before putting into the oven. I’d like to thank you for this amazing recipe. I made it a couple of times and everyone just loves it! Can I make it ahead of time, keep it in the refrigerator over night, and bake it the next day? Would this alter anything or change the wonderful taste? I wonder how much calories has it got per portion? Great recipe! Egg in bechamel was a new one for me, but it tasted really good.